I’ve always been an athlete. I grew up in a household of athletes from my Dad playing basketball and running, to my Mom who played softball and coached. My siblings were amazing athletes excelling in football and soccer. I played organized sports up until my boyfriend took me hiking for the first time just before I graduated from high school. We hiked Mount Lafayette in the White Mountains of New Hampshire. I was instantly hooked. I started hiking almost every weekend and backpacking by myself to bag peaks. My outdoor life started on this day in the White Mountains. Ten years later I moved to my first mountain town, Bethel, Maine and started writing the stories that eventually became Continental Quotient, Stories From Both Sides of the Divide. This book came together as a wish to share the universal need to go on adventures and to see where they lead – perhaps even starting over again. I wanted to tell my stories about discovering great places to live and the forever friends I found in these mountain towns. My peak bagging career spanned just over a decade starting in 1988, my senior year in high school. My boyfriend and his family took me on my first overnight hiking trip to Mount Lafayette in the White Mountains of New Hampshire and we stayed in the Greenleaf Hut. The hut had bunk beds and blankets so I didn’t need anything other than new hiking boots; thick soled Dunham’s with red laces, and a backpack with food, which was an early high school graduation present. Somehow I just knew that I was going to love hiking and being in the woods, my parents obliged by buying the red North Face Snow Leopard internal frame pack with yellow straps. We hiked the Old Bridle Path, a trail that began at the valley floor and climbed steadily to the Greenleaf Hut. I studied the trail in the AMC Guide for weeks before the day. I learned it was the easiest trail to reach the summit of Mount Lafayette since it was formerly a carriage road that took visitors to the minor summit of Mount Lafayette in the early 1900s. It was a great pick for my first hike. As we ascended the first minor peak, I could see views of the valley south and endless trees. It was so quiet; I was hooked. Since I was an athlete I liked hiking from the workout perspective and the goal achieved by sweating and hard work. By the time we reached the hut my heart was pounding and my body was drenched in sweat. We didn’t reach the summit the first day; the big moment was saved for the following morning. We awoke at first light, and the hike to the summit began after a quick breakfast. Our group reached the peak in an hour. The trail followed the Franconia Ridge across to Mount Lincoln (two peaks on the same day). The wind was fierce on the ridge and I felt that any moment I would be blown down either side of the small ridge and never be found again. After an hour on the ridge we ascended the Falling Waters Trail back into protected woods, the “peak bagger” came out in me. This first hike sparked my love of the mountains and feeling I could do anything. I started making goals including one to hike all the 4,000 footers in New Hampshire. After reaching each mountain peak I gained the confidence to start other outdoor adventures such as downhill skiing, and later Nordic skiing. Hiking the Presidential Traverse in the White Mountains gave me my first taste of “going long” and becoming an endurance athlete. I started running and biking. A few years later I became a triathlete and finished three Ironman triathlons. I now live in Tucson – the southwest desert, and long to re-visit all the places I write about in my book. I want to go back and do it all again. However, for now, I’m enjoying wearing shorts while I road bike outside in November. I will ultimately return to New England and finish hiking my 4,000 footers to get in the club. There are so many hikes I want to complete such as El Camino de Santiago, the AT, the PCT, and the Continental Divide Trail. These long trails are all on my bucket list. I know I will complete them at some point in the next few years. Being outdoors and having active goals reminds me that every day is a gift and not to squander time. I hope that readers will read my book and go live in a mountain town, even if it’s just for a year. I hope they will take risks and live where they want to live. Every day should be an adventure. 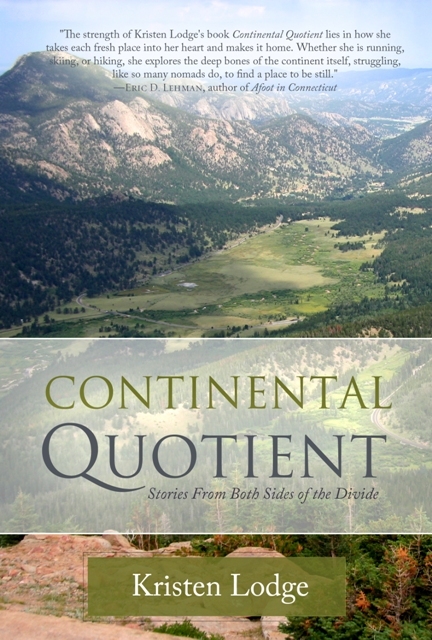 Continental Quotient, Stories From Both Sides of the Divide is available on Amazon.com, BN.com and from Homebound Publications. Kristen grew up in Plattsburgh, New York and Rye, New Hampshire. She earned a BA in English from the University of New Hampshire. From 1999 to 2012 she lived in ski towns in northern New England and Colorado including Killington, Vermont; Bethel, Maine; Steamboat Springs, Colo.; and Granby near Winter Park, Colo. She now lives near the Tucson desert with her dogs: Daisy and Winnie. Kristen is an outdoor adventurer; hiking, competing in road and mountain biking races, triathlon, and trail running. 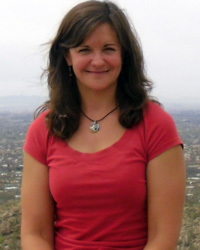 Exploring the outdoor world is part of her everyday life and is reflected in much of her work. She has published several poems and stories in anthologies, literary magazines and online publications including Wilderness House Literary Review, Press Pause Moments: Essays About Life Transitions by Women Writers, NPR’s: This I Believe, Diverse Voices Quarterly, and River Poets Journal. For four years she wrote a weekly outdoor column for a community newspaper in Grand County, Colorado writing about skiing, hiking, poetry, environmental issues, sports, historical preservation, and interviewed several adventurers from Colorado.